Davka, the vanguard ensemble of new Jewish music, offers up an evening of unbridled innovation, amazing virtuosity, and irresistible soul. Writers have called Davka's music "neo-Jewish-roots-fusion," "the acoustic equivalent of a Chagall painting," and "fiddler-on-too-much-Turkish-coffee," but perhaps the best insight into their music is the meaning of the group’s name, a Hebrew slang term for "contrary to expectation." 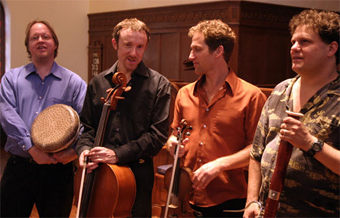 Redefining world music with seamless compositions inspired by klezmer, classical, Middle Eastern and Asian rhythms, and jazz, the group's performers brim with passion, lyricism, and virtuosic interplay. Davka features Paul Hanson on bassoon, Daniel Hoffman on violin, Kevin Mummey on percussion, and Moses Sedler on cello. For this evening’s show, the group is joined by special guest percussionist, Persian percussionist Pezhham Akhavass. In the words of the San Francisco Chronicle's Jerry Karp, "Davka's four musicians whirl their spells with a supple interplay of violin, cello, bassoon and percussion. Their compositions and improvisations, swirling around a center of enlivened klezmer melodies and pulsing Middle Eastern rhythms, weave a dancing, winding path through the diversity of Jewish cultural and historic experience."